Medley, FL – On February 18, 2016, All Florida Paper was honored for being recognized as one of three finalists for Business of the Year (Large) in South Florida at the 2016 Entrepreneurial Awards presented by the Greater Miami Chamber of Commerce. The two other finalists included Vitas Healthcare – the leading provider of end-of-life care in the United States, and The Related Group (headed by billionaire Jorge Pérez) – Florida’s leading developer of sophisticated metropolitan living and one of the country’s largest real estate conglomerates. The host of the event was multi Emmy Award-winning journalist Jackie Nespral from NBC. 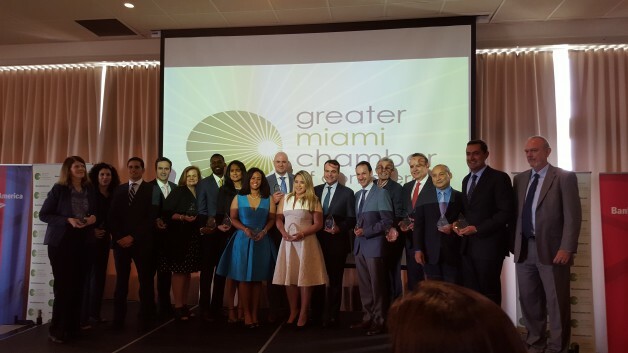 2016 Greater Miami Chamber of Commerce Top Entrepreneurial Awards hosted by the Rusty Pelican on February 18, 2016. “We are very excited to have been recognized by the Greater Miami Chamber Of Commerce as a Finalist for 2016 Business of the Year (for a large company). Even though we did not win, we are very pleased to have been considered along with The Related Group and Vitas Healthcare. This recognition in itself is a tribute to our team for their exceptional effort. All of our associates clearly understand our vision for the future. They embrace a culture of excellence and execute our corporate strategies with dedication and passion. More than 100 of South Florida’s most successful businesses were selected for nomination in a total of seven categories, including That’s so South Florida, Community Outreach, Executive of the Year, and Business of the Year among others. Some of them included El Dorado Furniture, MasterCard, and Skanska USA among others.